Wow, life has been so busy, and guess what? It don't think it will be slowing down....EVER! I picked these up last year in a junk pile for our city's spring clean up. Obviously one spindle was missing, and the seats were...well UGLY, and gross. I have made a promise (to my husband) to clean off the back patio, which is filled with free furniture I have collected. 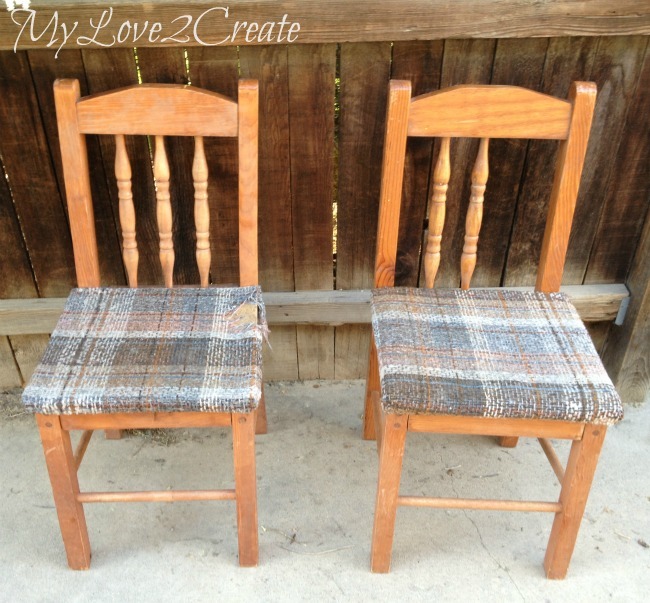 I sold a bunch for dirt cheap and saw these poor little chairs and decided it was time to make them awesome. I looked under and saw that the seats were stapled on, so I pried them off with a crow bar. The nails were sticking up everywhere so I hammered off the triangles, since they wouldn't be necessary with what I had planned. After some thinking, I decided that since I couldn't replace the missing spindle, I would cut them all out and do something else. I used my Roybi Sawzall and they were off in seconds, love this tool. 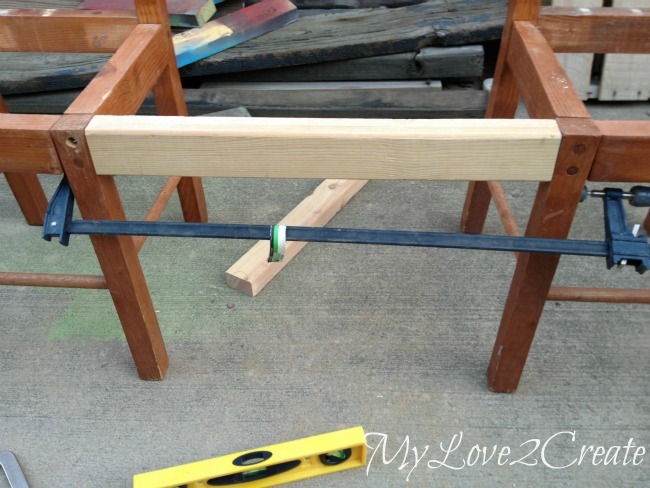 Then I gathered some scrap boards to make a bench! 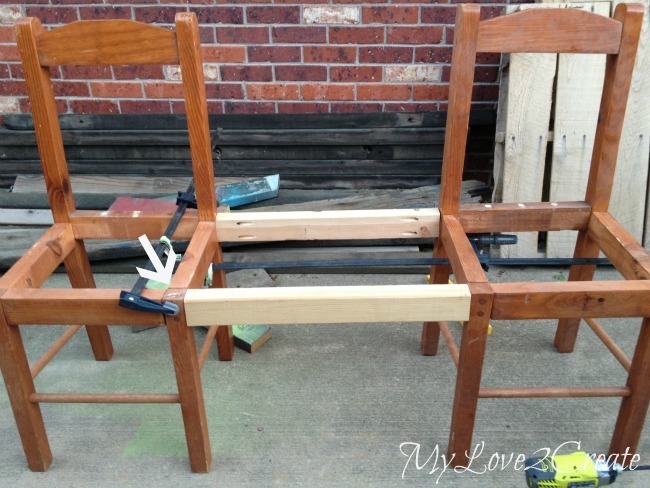 Using a 2x3 I drilled pocket holes and clamped it between the two chairs, the pocket holes are in the back. These chairs have seen a lot of weather and when I drilled the pocket hole on the right the wood started splitting. I put some glue in it and clamped it to dry. Then I added the back board. The top board was also added with pocket holes. I originally was going to use a piece from an old crib, but I accidentally cut it too short (figures), so I traced the pattern on a scrap 1x4 and used it. 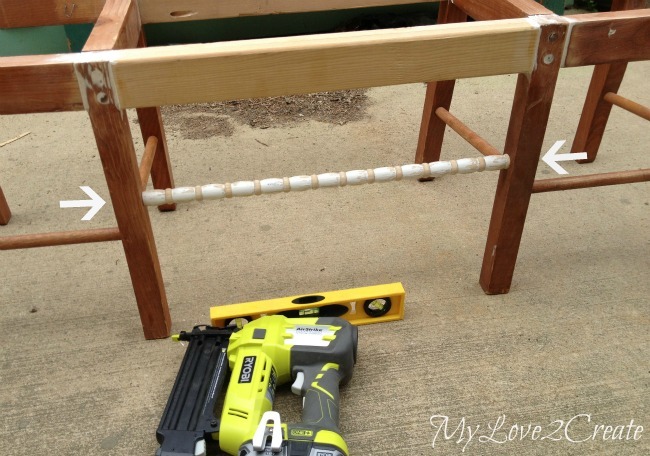 I then cut slats for the back of the chairs/bench and drilled pocket holes. 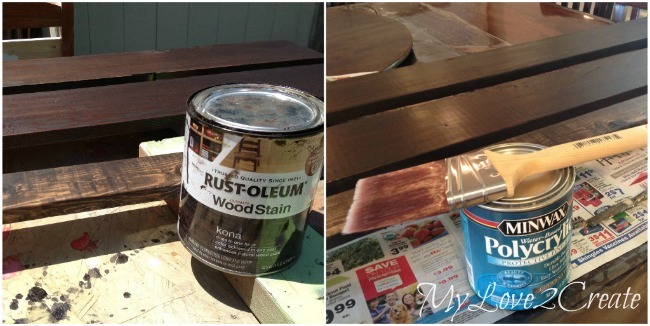 This wood was a left over shelf support board from my Master Closet Makeover. It was getting so hot, that I decided to bring it inside. I glued and screwed them in place, trying to keep the boards level and even. One chair was a little askew so it is not perfect, but hey that is ok! I have long since learned that perfection in projects is almost NEVER, and I am just fine with that. 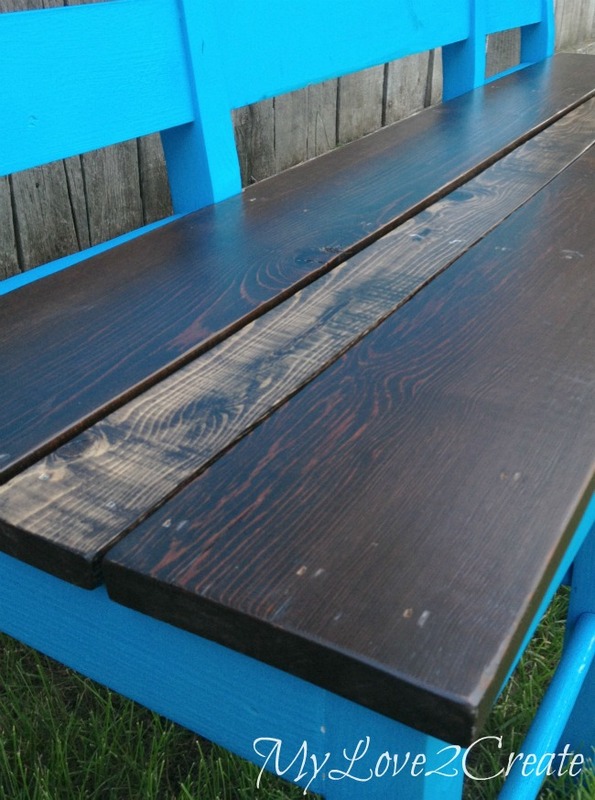 I filled all the cracks and holes with spackle, and brought it outside to find boards for a seat. A few months back I scored some reclaimed wood from a 1940's garden/nursery in Boulder, I took as much as I could! I used a couple of 1x6's from that stash and a 1x3 I had in the garage. Then I cut them to size. I had a spindle left from the crib I mentioned, I thought it would look cute in the front and help bring the piece together. You might recognize this spindle... I used some on my Repurposed Hook shelf into Book Shelf which happened to be my first contributor posts here. Using my Roybi air strike nailer I nailed it in from the sides of the legs, right where the arrows are pointing. The boards got some stain and poly. I guess I am still stuck on the dark wood...I did almost use the weathered gray that I used on my Old Deck Wood Laundry Crate, I did a sample of each on the back of the boards, but I liked the dark better. You can see the smaller board stained totally different because it is a different kind of wood. I knew that would happen I like the contrast. While the poly was drying I did some spray painting. I stared with the bench upside down, and then ended with it standing upright. I used about 1 and a half cans. 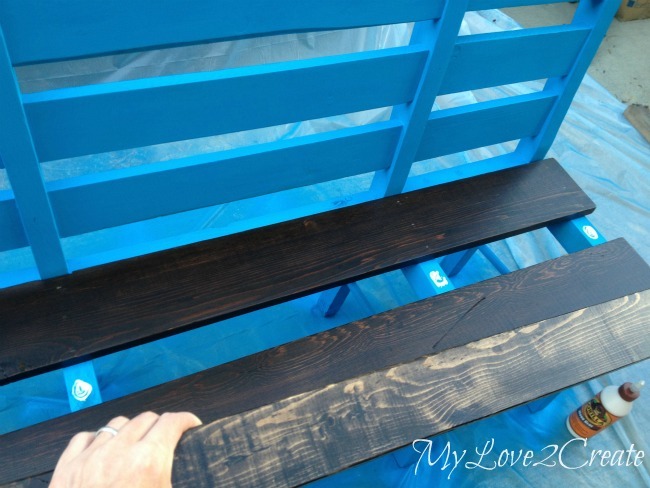 I was in a hurry and painting this bench by hand would have taken forever...so this bench was about $6 total, that is the cost of spray paint I had all the wood on hand, not bad! You can see a couple in the middle at the top that were nailed in...but I love it anyway! It is such a fun unique piece and I am excited to find a good place for it. 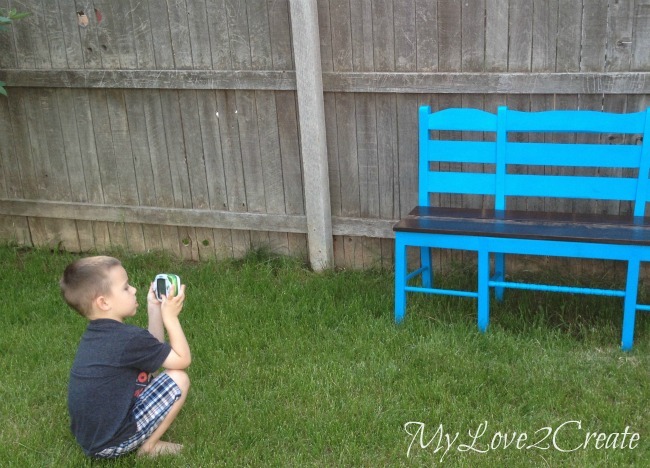 My little guy was helping me take pictures, It was awesome how he copied me by doing different angles... I couldn't resist sharing, he was being so cute! For now this bench is in my living room waiting for it's new home on the back patio, we have enjoyed testing it out. 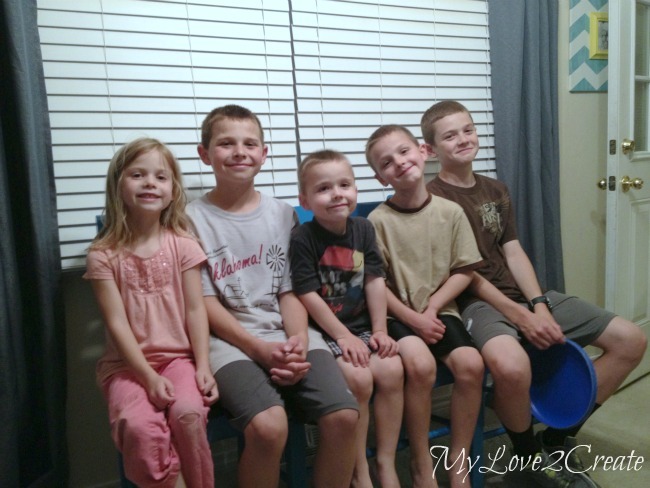 It fits five kids end to end, and four kids quite comfortably :). Aren't they cute? My third boy was in bed not feeling well when I took this shot, poor guy. 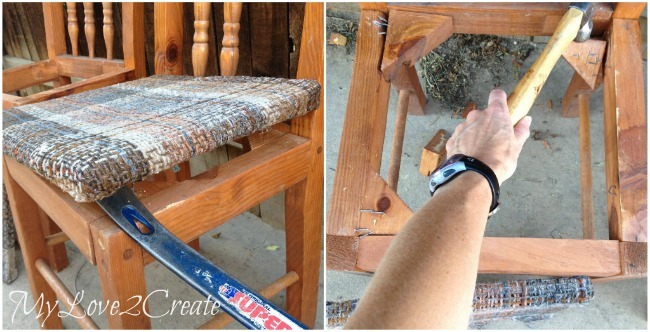 I am happy to have finally figured out what to do with those old ugly chairs. I think they are looking pretty good with a little TLC, what do you think?! If the stars align I will finish my back patio, just in time for...Fall...? Well, I guess that means it will be ready for next spring at least, which is good, gotta look at the bright side! I love this. 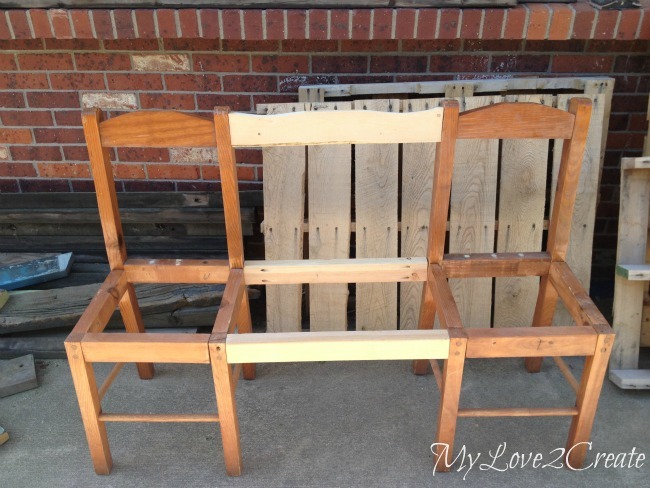 I am thinking of making a bench out of a couple of ladder back chairs for my dining room. Now you have inspired me. 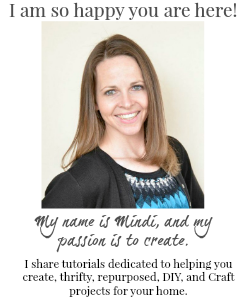 Mindi it is so nice you came by my blog now I have found you. I am a new follower. Have a great day. Bet it will look awesome on your deck. You rock, girl! I love all of your projects. 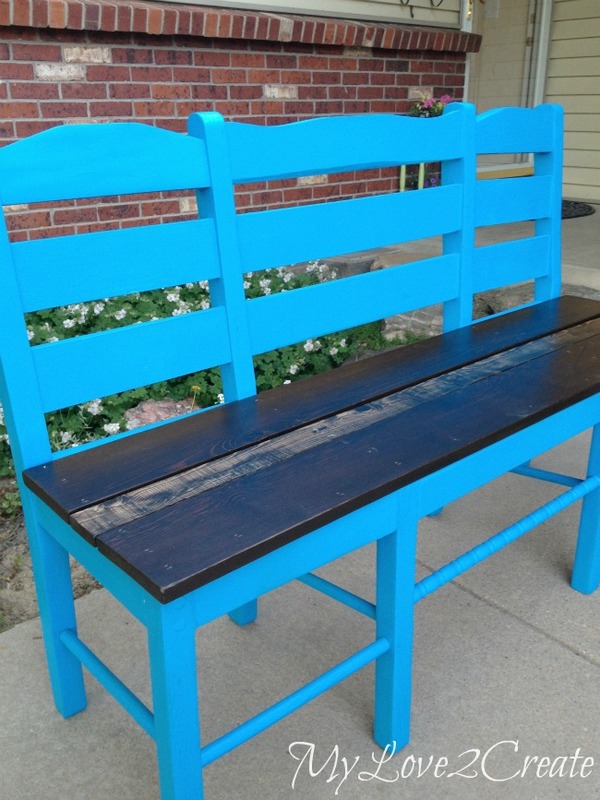 What a stunning bench and price! My daughter will be a senior! :/ it's like why time is running so fast?! Absolutely love this! 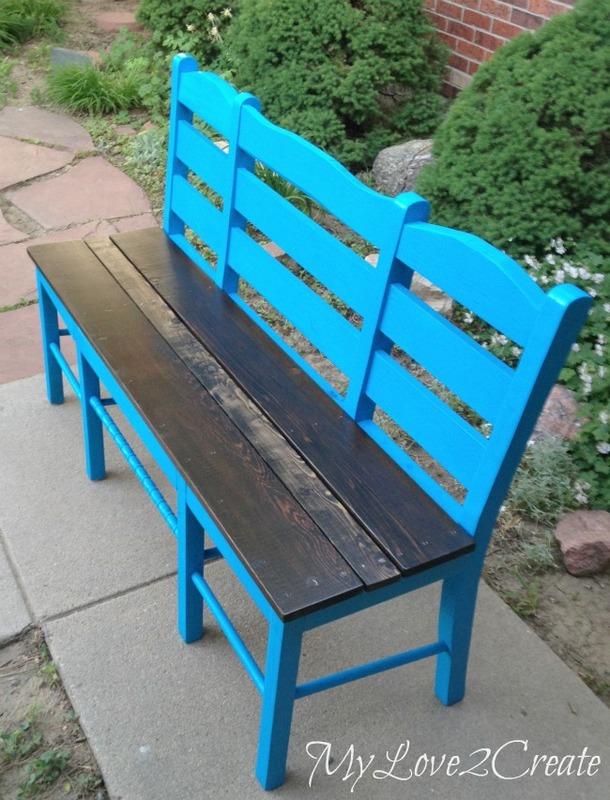 Try upcycle right here. 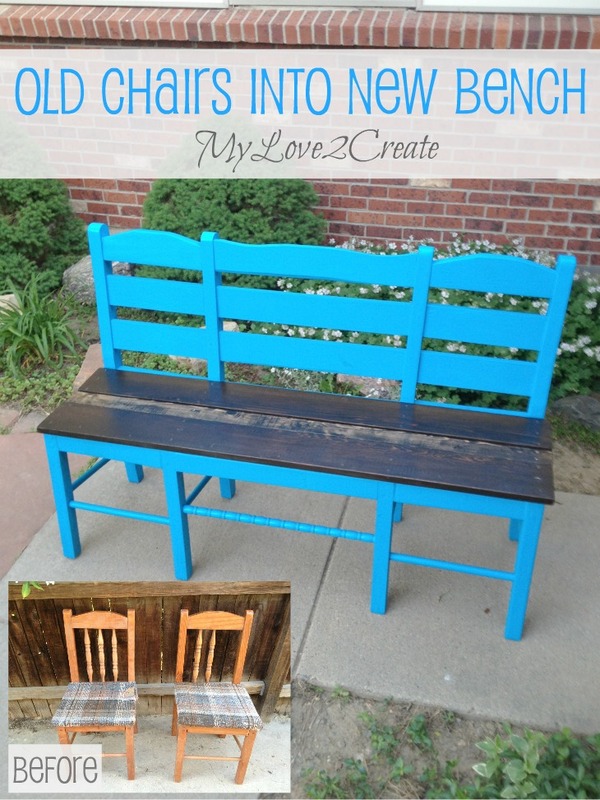 I love that the chairs were reclaimed, the wood and spindles were reclaimed, and that you made such an awesome piece! Great job. 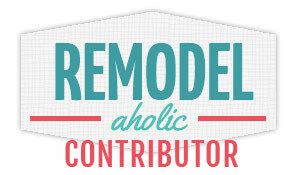 Thank you for sharing with The Caffeinated Crafters Link Party this week! Love this! Pinning for sure! I thought you found a cool, wide chair for the center. Nope, you just made it yourself. Wow! Now that is trash to treasure. 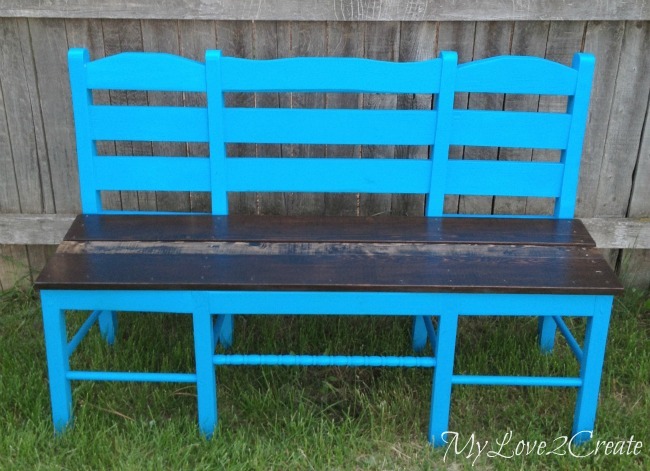 Love the color of the bench. So bright and fun. U don't think the life will be slowing down, i agree. We are always busy, but I like that. Nice bench. I love this ! 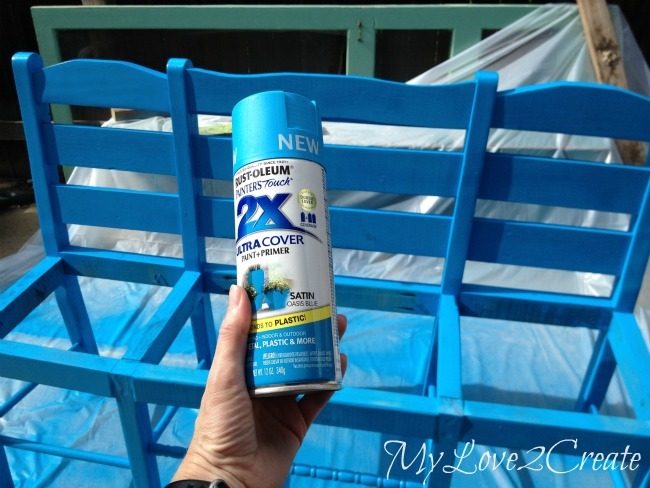 What a fantastic and useful transformation for the chairs! Glad that these chairs ended up with you - otherwise, they'd be a goner for sure. Mindy, I admire your vision. You found the beauty in those sad chairs and you kept at it until they turned out gorgeous. Excellent job! This is fantastic! Thanks for sharing a very detailed tutorial how we can do it ourselves! I hope to do the same with our bedroom as similar looking design, too. Mindi, how much time it takes? Girl, You Rock! Excellent Post. Thanks for Sharing excellent project with us.